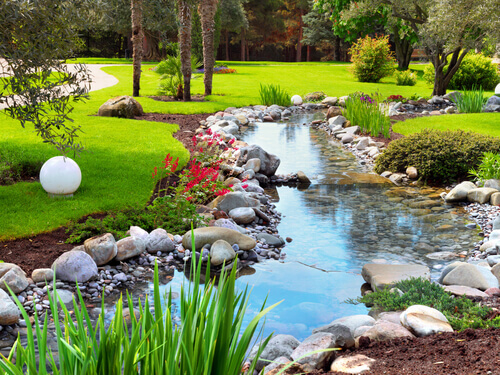 Both water gardens and ponds have been increasing in popularity across the United States. Their beauty, aesthetic appeal, and ability to put one in touch with nature make them attractive. Furthermore, research shows that the presence of moving water is psychologically soothing to humans, the reason so many people enjoy going to the beach and lakes. Below are some of the most popular water garden trends for 2019. These types of fountains have become high in demand because of their affordability and minimal maintenance requirements. They might simply consist of a rock with holes bored within it which allows water to travel through or it may come in the form of a ceramic vase, which are prized for their vivid coloration. Additional benefits of bubbling fountains include natural humidity (due to the moisture they add to the air), and have been reported to alleviate dry skin and even sore throats. As such they are popular indoors during winter. Yet another benefit of bubbling fountains is their ability to cancel noise. A growing number of people live in either urban or suburban areas where they are subjected to annoying sounds on a daily basis, from neighbors, traffic and other sources. A bubble fountain is the perfect way to drown out all these unwanted sounds with the pleasant and relaxing sound of running water. Sheet waterfalls are coveted due to their ability to enhance outdoor spaces through the incorporation of bricks or blocks. The most sought after among them are formal sheet waterfalls, as the system will be installed within the block wall which creates a distinct aquatic experience. Sheet waterfalls are also usually accompanied by LED lights which produce spectacular visual effects after dark. Waterfalls which are pond less are also referred to as cascading falls, and function by having the water vanish into a gravel bed, after which it will be re-circulated and transferred upwards again. Although such waterfalls have been around for years, what is different about 2019 is that pond owners are demanding water which moves slower, streaming as opposed to crashing. The reason for this is because slower moving water offers greater peace and serenity while also allowing wildlife to drink it in safety. Pond less waterfalls is also ideal in areas where you want a waterfall but don’t have enough space to combine it with a pond. Like bubbling fountains, rock column styled fountains are also low maintenance, but since they are larger on average they carry a slightly higher price tag. When installed rock columns will usually be installed within a three series set in close proximity to one another. The water will vanish into a gravel bed after which it will be re-circulated into a column. These fountains may consist of a solitary rock or may be grouped with specimen stones. They are exceptionally versatile.